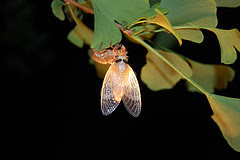 A great photo of a cicada on Ginkgo leaves. * New photo photospecial page: Ginkgo biloba 'Mariken' in fall. * Added photo of Rong Qiqi, The Seven Worthies of the Bamboo Grove on my Art-page (gallery). Ginkgo seeds gathering in China at Yunnan University in Kunming. 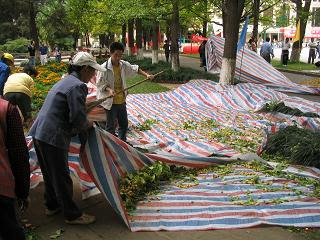 Some tarps are put on the ground; several men climb the trees wielding giant bamboo staffs which they use to knock all the branches. The loosely attached seeds pour off the tree onto the tarp. Read more here. More info about the seeds on my Usage-page. * Added on my Art- and Bonsai-page: photo of Wagashi Art: Ginkgo bonsai. 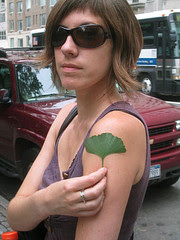 * Added YouTube video: Ginkgo wind mobile.